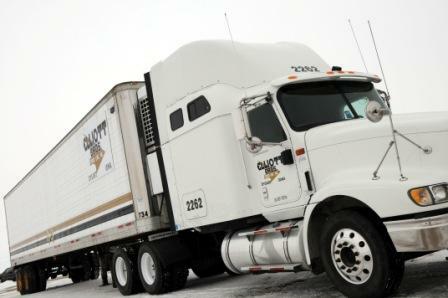 Elliott Brothers Truck Line is a small company with a personal relationship with every driver. The fleet size is 60 to 65 drivers and the retention rate is over 7 years. The operation is focused on the Midwest with customers based in Iowa. They were the recipients of the Iowa Motor Truck Association “Fleet Safety Award” for the years 2007 and 2008 and Kathy Barber was named the “Iowa Safety Professional of the Year” in 2009. Elliott Brothers Truck Line was nominated for a Tama County EDIE award in 2009 in the expansion category as they took advantage of the oportunity for developing new business avenues as their customer base and number of employees grew. They are certified for HUBZone government contracts.